Is it a coincidence it was Alice who navigated us through Wonderland or that it was Dorothy who walked us through the Land of Oz. We are all inside the Looking Glass now, inside the storm, whether environmental or political. This is a time of disruption and artists of all genres are gathering up the pieces of the past and rearranging and rebuilding. But out of the corner of my eye I see something else. I see more and more women emerging as the central force behind the rebuild. As the world, built on colonial paternalistic pillars, crumbles it is women who are towers of strength. As men thrash around looking for someone to blame, it is women who are getting on with the work of creating a new home. Before the disruption men were born complete, their roles defined, their destiny ordained while women could only be completed by the presence of a man in their life. Not so much anymore. The Old White Males and their acolytes are hanging on but their grip is weak. While they cling to power the artists, the female artists, have been working. From left: Virtues & Vicissitudes detail, 2.5x4.75m, mixed media on board, 2017, Ramune Luminaire; Separation, 70x100cm, oil on board, 2017, Judith A. Mason; Dementia detail, 91x213cm, mixed media on paper, 2017, Mary Kainer. At the Visual Arts Centre in September there was an exhibit, “Coming of Age” featuring three mature female artists, Mary Kainer, Ramune Luminaire, and Judith A. Mason. They were collectively exploring what being old means. Old age has meant fear for men but for women it can mean freedom. The Old Crone archetype of myth and legend wields substantial power. It is power that comes with wisdom, knowledge, comes of having lived and worked and shared the unwritten over the work. This sharing is explored in Toni Hamel’s exhibit “The Lingering” shown in 2015 “The Lingering” explored the role of the female as homemaker, simultaneously rejecting those homes as gilded cages and celebrating the creativity of the work done by the women. The work of women does seem tilted towards the creative arts however. Although female artists are underrepresented in the 'HIS'tory of art, women are well represented in the management of galleries, at least here in Durham Region. At every level whether private or public it is females who are at the helm, even at the municipal level; Oshawa’s CultureCounts department and its overseer, Parks and Recreation, are manned mostly by women. It makes for an odd situation; Females are in charge of the walls and stages yet females are underrepresented when it comes to shows and exhibits. But something is changing. Female artists are missing from the canon yes but we are finding them, or rather they are finding us. I took a walk a week or so ago, well a drive, to three Durham Region galleries and what I saw was capital W Work, the getting on with the Work, the doing. Ingrid Ruthig’s solo show Re/Visions at the Station Gallery is a massive engagement for the eye and mind. One is struck immediately by the volume of work. 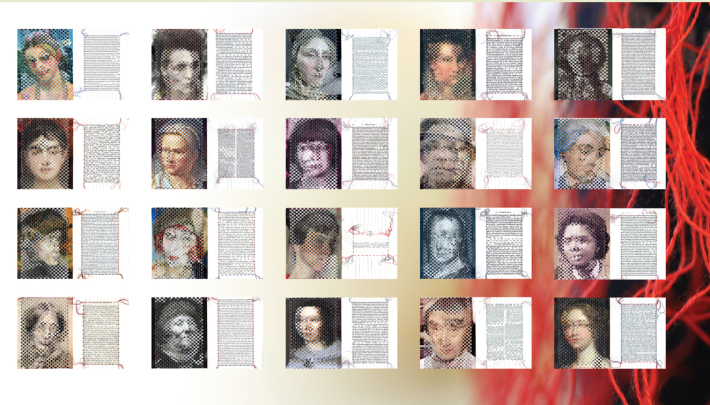 120 portraits of 120 ladies, each woven from images and text. It is not something absorbed in a glance. These portraits are not icons, cartoons. It is architectural, sculptural, it is deep thoughtfulness and one can see perhaps it is the work of it which is at the centre of it. Not art for art’s sake but work for art’s sake. Finding Florence is the other show on at the Station Gallery. Florence Helena McGillivray was born in 1864 in Whitby and painted her whole life, teaching at what is now Trafalgar Castle School. She travelled Europe and brought the modernist influence to her paintings.Her work is in the National Gallery, the AGO, the RMG and the Art Gallery of Hamilton. But as the kids say Who knew? She was lost but like Alice and Dorothy has found her own way back. Sometimes its a matter of time. Sometimes its a matter of what endures, of what lasts. The work of Alexandra Luke and Isabel McLaughlin has lasted. The two were a force in Canadian Abstract art, enabling and creating a home for those men who would become the better-known members of Painters 11. Margaret Rodgers has curated an exhibition at the Robert McLaughlin Gallery, pairing the works of Luke and McLaughlin with two modern artists, Teri Donovan and Gwen MacGregor. Donovan and MacGregor show how difficult it was for women of the past to build an identity for themselves separate from the relationship with a man. The Paint Factory Gallery has a show too featuring not just females but males too. While the paintings by Joaquin Manay are gruesome in a way, I do not see them as purposefully so. What I see is an artist endeavouring to capture how people create their own identity. How we create ourselves one piece at a time, taking one piece from someone else, one piece not quite fitting, but over time an identity will emerge, the picture will reveal itself from a distance. Give it time. So it is with Ruthig’s work. The further one steps back from the portrait the closer one comes to the identity of the subject. It is an exhibit which demands time, which demands distance. It took time and distance to make and all of that is present in the work. To fully understand this show one needs to give it what it asks. It is not something delivered on your terms. This exhibit of women will be seen on its terms. I stepped away from Ruthig’s Re/Visions and saw better the women within. These are women as activists, as makers, as creators, as doers, as lost and found, as figure and ground, as a new gathering force. The next step demanded by this force is for us, or for me at least to stop making random connections based on gender. These artists are not female artists, just artists.